Jerusalem-The Simon Wiesenthal Center today welcomed the indictment yesterday in Muenster, Germany of two guards from the Stutthof concentration camp near Gdansk, Poland. In a statement issued by its chief Nazi-hunter Dr. Efraim Zuroff, the Center noted the importance of the final efforts to bring Holocaust perpetrators to justice and congratulated the German prosecutors on their efforts in the case. “During the past four months, the Wiesenthal Center has located eighteen survivors of Stutthof,most of whom currently live in Israel,to assist the preparations for the trial of the Stutthof guards. Other survivors were located in the United States and Sweden. These survivors were primarily Jews from Lithuanian ghettoes and Hungarian Jews who had initially been deported to Auschwitz. Approximately 110,000 Jews and non-Jews were deported to Stutthof and about 85,000 were murdered there. In 1943 a gas chamber was built there to facilitate the last stages of the Final Solution. "We urge anyone with information regarding Stutthof survivors to contact us as soon as possible." ירושלים-מרכז שמעון ויזנטל הביע סיפוק רב על הגשת כתב-אישום אתמול במונסטר, גרמניה נגד שני זקיפים ששירתו במחנה הריכוז שטוטהוף בפולין (בקרבת העיר גדנסק). בהודעה שפרסם היום צייד הנאצים הראשי של המרכז, הד"ר אפרים זורוף, צוינה חשיבותה של הבאת מבצעי פשעי השואה לדין ונשלחו ברכות לאנשי התביעה על מאמציהם בתיק זה. "במרוצת ארבעת החודשים האחרונים, מרכז ויזנטל בישראל איתר שמונה עשרה ניצולים ממחנה שטוטהוף, רובם הגדול תושבי ישראל, כדי לסייע לתביעה בגרמניה בתיק הזה. (הניצולים האחרים הם תושבי ארה"ב ושבדיה.) ניצולים אלה הם בעיקר מי שנכלא תחילה בגיטאות בליטא או יהודים מהונגריה שקודם גורשו לאושויץ. בערך 110,000 יהודים ולא-יהודים גורשו לשטוטהוף וכ-85,000 נרצחו שם. בשנת 1943 נבנה שם תא גאזים כדי לסייע לגרמנים להשלים את הפתרון הסופי. "אנו פונים בבקשה לכל מי שמכיר אדם שגורש לשטוטהוף להודיע לנו בהקדם האפשרי." Jerusalem-The Simon Wiesenthal Center today issued a call for survivors of the Stutthof concentration camp near Gdansk (Poland), as well as first-degree relatives (child or sibling) of victims of the camp, to consider serving as co-plaintiffs in trials of Stutthof guards which will hopefully be conducted in Germany in the coming year. The trial is a result of a change in German prosecution policy, whereby any person who served in a concentration camp with the apparatus for industrialized murder (gas chambers or gas vans) can be convicted for accessory to murder based on service alone, which was not the case until about a decade ago. To date three individuals who served in death camps (Ivan Demjanjuk at Sobibor; Oskar Groening and Reinhold Hanning at Auschwitz) have been thus convicted. "At this late date, every trial is extremely important, and the role of co-plaintiffs is of unique significance. We urge all survivors of Stutthof, as well as first-degree relatives of those murdered in the camp,to contact our Jerusalem office (tel. 02.563.1274 / e-mail: swcjerus@netvision.net.il ) to help make the case of the prosecution as effective and convincing as possible." Jerusalem-The Simon Wiesenthal Center today urged the German judicial authorities to expedite the remaining cases of Nazi war criminals in the wake of the recent death of convicted Auschwitz guard Reinhold Hanning before he could serve his jail sentence. In a statement issued here by its chief Nazi-hunter Dr. EfraimZuroff, the Center emphasized the importance of the implementation of the sentences meted out by German courts in recent years to convicted death camp guards and operatives. "The punishment of convicted Nazi war criminals is an integral and highly significant component of the judicial process. The fact that none of the three death camp guards and operatives convicted in recent years in German courts have served their sentences weakens the impact of these important judicial decisions. We urge the German judicial authorities to find a way to expedite these cases so that those justifiably sentenced to imprisonment do not escape punishment due to bureaucracy and/or misplaced sympathy." Jerusalem– The Simon Wiesenthal Center today welcomed the confirmation by the German Federal Court of Justice of the conviction of Oskar Groening in July 2015 on charges of accessory to murder for his service in the Auschwitz death camp. In a statement issued here by its chief Nazi-hunter Dr. EfraimZuroff, the Center emphasized the importance of the ongoing efforts to bring Holocaust perpetrators to justice. "Despite the passage of decades since these crimes were committed, the importance of holding the perpetrators accountable for their crimes remains as valid as ever. The passage of time in no way diminishes the guilt of the killers and old age should not afford protection to those who committed such heinous crimes against innocent people of all ages, some of whom were even older than these defendants. We urge the German authorities to do whatever possible to maximize justice before it is too late." Jerusalem-The Simon Wiesenthal Center welcomed the conviction in a German court today of Auschwitz death camp guard Reinhold Henning and his sentence of five years in prison. In a statement issued here by its chief Nazi-hunter, Dr. Efraim Zuroff, the Center noted that the verdict reflected the important role in the mass murder process played by individuals who did not necessarily have a high rank, but without whose active and often zealous participation, the annihilation operation at Auschwitz-Birkenau could never have succeeded in killing approximately 1,300,000 innocent persons, among them 1,100,000 Jews. The Center also called upon the German authorities to expedite the current investigations of additional cases of death camp guards and those who served in the notorious Einsatzgruppen (special mobile killing units) which operated in Eastern Europe and murdered approximately 1,500,000 innocent victims. "This verdict is the third conviction obtained by German prosecutors in the wake of a dramatic change instituted several years ago in the prosecution of suspected Nazi war criminals, which enables bringing to justice on charges of accessory to murder, any person who served in Nazi death camps or murder squads. This change, which far better reflects the reality of the Final Solution than the previous policy, which made the prosecution of Holocaust perpetrators almost impossible, was a landmark decision which was long overdue, and is a corrective for many years during which the will to maximize justice was clearly lacking. "We urge the German authorities to do everything in their power to expedite the remaining cases. The pursuit of justice for Holocaust victims deserves a maximum effort while those responsible for the crimes of the Third Reich can still be held accountable." מרכז ויזנטל קיבל בברכה היום את הרשעתו בגרמניה של אוסקר גרונינג, מי ששרת מספר שנים במחנה המוות אושוויץ-בירקנאו. בהודעה שנמסרה היום ע"י צייד הנאצים הראשי שלה, ומנהל המשרד בישראל דר אפרים זורוף, המרכז הדגיש את חשיבותו של ההרשעה וגזר הדין של ארבע שנות מאסר והביע תקוה שיהיה מאמץ להחיש את אותן חקירות המתנהלות כעת בגרמניה נגד פושעים נאצים נוספים. "אנו מקווים שהרשעתו המוצדקת של מי שהיה אחראי לגנבת כספם של היהודים שגורשו לאושוויץ והעברת כספים אלו לברלין לשימוש של המשטר הנאצי תסלול את הדרך להרשעתם של פושעים נאצים נוספים. ברור לכולנו שחלון ההזדמנויות להעמדתם לדין של פושעי השואה תיסגר בקרוב ולכן חשוב במיוחד ששלטונות גרמניה יחישו את התהליכים הנחוצים להעמדתם לדין של פושעים נוספים כל עוד ניתן להעמידם לדין." Jerusalem-The Simon Wiesenthal Center welcomed the conviction today by a German court in Luneberg of Oscar Groening for his wartime service in the notorious Nazi death camp of Auschwitz-Birkenau. In a statement issued here today by its chief Nazi hunter, Israel director Dr. EfraimZuroff, the Center emphasized the importance of the conviction and expressed hope that the ongoing investigations by German judicial officials of Holocaust perpetrators would be expedited to maximize justice while these individuals can still be held accountable for their crimes. "The well-deserved conviction of Auschwitz 'accountant' Groening will hopefully pave the way for additional prosecutions of individuals who served in death camps and the special mobile killing units (Einsatzgruppen). It is abundantly clear that the window of opportunity to bring Holocaust perpetrators to justice will soon be closed, which makes the expedition of these cases of exceptional urgency. We therefore call upon the German government to make available the necessary resources and upon the judicial officials to give first priority to these cases." Jerusalem–The Simon Wiesenthal Center announced here today that it had submittedto the German ministers of justice (Heiko Maas) and the interior (Thomas de Maiziere) a list of 80 persons (76 men and 4 women) who had served in the notorious Nazi Einsatzgruppen (mobile killing squads), which murdered more than a million Jews by shooting in areas of the Soviet Union during the Holocaust. In a statement issued here today by its chief Nazi-hunter, Israel director Dr. EfraimZuroff, the Center explained that the suspects in question were the youngest members of the mobile killing squads listed in documents in the Center's possession. "The individuals whose names we submitted to the German ministers were all born between 1920 and 1924 and constitute the suspects most likely to still be alive and healthy enough to face prosecution. The list was submitted in the hope of encouraging the German judicial authorities to expedite the efforts to bring these killers to justice and to offer the Center's assistance in this important project." Background: Following the May 2011 conviction in Germany of Sobibor death camp guard Ivan Demjanjuk solely on the basis of his service in the camp, German prosecutors began searching for death camp guards and death squad members, who could now be brought to trial without proof that they had committed a specific crime against a specific victim (as had been the case in Germany for the previous fifty years). During the past year, German prosecutors had announced locating more than fifty death camp guards, but not a single member of a death squad. Jerusalem–The Simon Wiesenthal Center today expressed its regret and frustration in the wake of the death in Philadelphia yesterday of Auschwitz guard Johann Breyer while facing extradition to Germany to stand trial for his service in the notorious death camp. In a statement issued here today by its chief Nazi hunter, Israel director Dr. Efraim Zuroff, the Center, which was actively involved in the search for co-plaintiffs in the case, noted the continued importance of bringing death camp guards to justice despite the many years which have passed since the Holocaust. "The death of a guard who served in the notorious Birkenau death camp shortly before his extradition to stand trial is obviously a source of frustration, but should not halt or discourage the ongoing efforts to prosecute Holocaust perpetrators. The passage of time in no way diminishes the guilt of the murderers and those who assisted them, nor should old age help such persons elude justice. They are the last people on earth who deserve any sympathy, since they had none for their innocent victims, some of whom were even older than they are today." The Simon Wiesenthal Center fully intends to continue its efforts to help facilitate the attainment of justice for all the victims of the Holocaust. Jerusalem – Das Simon Wiesenthal Center brachte große Freude über die Ankündigung der Zentralen Stelle zur Bearbeitung von NS-Verbrechen in Ludwigsburg zum Ausdruck, wonach gegen 30 ehemalige Aufseher des Vernichtungslagers Auschwitz-Birkenau weiter ermittelt werden soll. Die Beschuldigten leben in Deutschland. In einer Stellungnahme lobte der Nazi-Jäger und Direktor des Wiesenthal Büros in Jerusalem, Dr. Efraim Zuroff, heute die Initiative, die im Zuge der Verurteilung des SS-Aufsehers im Vernichtungslager Sobibor, Iwan Demjanjuk, ergriffen wurde. Gleichzeitig brachte Zuroff sein Bedauern darüber zum Ausdruck, dass es solche Bemühungen um eine Strafverfolgung dieser Täter nicht viel früher gegeben hat. "Die heutige Ankündigung ist ein wichtiger Meilenstein für die Bemühungen der Bundesrepublik Deutschland, NS-Verbrecher zur Rechenschaft zu ziehen, und der Zentralen Stelle in Ludwigsburg gebührt große Anerkennung für diese wichtige Initiative. Gleichzeitig unterstreicht die heutige positive Entwicklung das Versäumnis der vergangenen fünf Jahrzehnte, solche Maßnahmen zu ergreifen. Diese Untätigkeit erlaubte es Tausenden der schlimmsten Direkttäter, der Gerechtigkeit zu entkommen." ירושלים – מרכז שמעון ויזנטל הביע סיפוק עמוק בעקבות הודעת המשרד הראשי לחקירת פשעי הנאצים בגרמניה על המלצתם להעמיד לדין שלושים שומרים ממחנה המוות אושוויץ-בירקנאו החיים היום ברפובליקה הפדרלית. בהודעה שפרסם היום צייד הנאצים הראשי של המרכז ומנהל משרדה בישראל, ד"ר אפרים זורוף, המרכז הביע הערכה רבה לגבי היוזמה להעמיד לדין את השומרים וציין שהיא תוצאה של הרשעתו לפני שנתיים במינכן של איוון דמיניוק בגין שירותו כזקיף ס.ס. חמוש במחנה המוות סוביבור. "המלצת המשרד לחקירת פשעי הנאצים להעמיד לדין מספר כל כך גדול של זקיפים ממחנה המוות אושוויץ היא סימן-דרך חשובה בתולדות המאמצים להביא למשפט את פושעי השואה החיים בגרמניה. בד בבד, אפשר רק להצטער שצעדים דומים לא ננקטו במשך חמישים שנים אחרונות ומדיניות זו איפשרה לאלפים מבין הגרועים ביותר מבין הרוצחים להמלט מענישה." Jerusalem – The Simon Wiesenthal Center expressed deep satisfaction at the announcement today by officials of the German Central Prosecution Office (Zentrale Stelle) that it would pursue the cases of thirty former guards at the Auschwitz-Birkenau death camp, who are currently living in Germany. In a statement issued here today by its chief Nazi-hunter, Israel director Dr. Efraim Zuroff, the Center praised the initiative, which was launched in the wake of the conviction in Munich in 2011 of armed SS Sobibor death camp guard Ivan Demjanjuk, while expressing regret that such legal reasoning had not been previously applied in such cases for many years. "Today's announcement marks an important milestone in the efforts to bring Nazi war criminals to justice in the Federal Republic, and the Central Prosecution Office deserves full credit for this important initiative. At the same time, today's positive development underscores the failure to take such measures during the past five decades, a decision which allowed thousands of the worst hands-on killers to elude justice." Jerusalem. Das Simon Wiesenthal Center hat die heutige Anklageerhebung gegen den früheren Polizeichef und Ghettokommandanten von Kosice, Laszlo Csatary, in Budapest begrüßt. Kosice gehört heute zur Slowakei, war während des II. Weltkriegs von Ungarn besetzt. In einer ersten Stellungnahme sagte der Nazijäger und Leiter des Jerusalemer Büros des Wiesenthal Centers, Dr. Efraim Zuroff, dass es sehr wichtig sei, dass Csatary vor Gericht gestellt wird. Zuroff hatte Csatary in Budapest ausfindig gemacht und die ungarischen Behörden informiert. Der frühere Kommandant des Ghettos in Kosice spielte eine Schlüsselrolle bei der Deportation von etwa 15.700 Juden nach Auschwitz, wo die meisten von ihnen ermordet wurden. Jerusalem. Das Simon Wiesenthal Center hat heute alle Fußballfans in der ukrainischen Stadt Lwiw dazu aufgerufen, zwei antisemitische Restaurants zu boykottieren. In Lwiw finden drei Spiele der Gruppe B bei der Fußball-Europameisterschaft statt. Die deutsche Mannschaft träg hier zwei ihrer Gruppenspiele aus. In einer Stellungnahme nannte der Leiter des Jerusalemer Büros des Centers, der Holocaust-Historiker Efraim Zuroff, die Restaurants „At the Golden Rose“ und „Kryvika“ (Versteck), die Antisemitismus und ukrainischen Extremismus verbreiten. Er rät den Fußballfans, woanders zu essen. Im „Golden Rose“ erhalten die Gäste Hüte mit Schläfenlocken. So können sie ultraorthodoxe Juden imitieren. Es gibt keine Preisliste. Die Kunden sollen um den Preis „schachern“, ein antisemitisches Klischee, das in Osteuropa verbreitet ist. Das ARD-Nachtmagazin hatte am Mittwoch über Ausschreitungen der rechtsextremen Fans des örtlichen Klubs Karpaty Lwiw berichtet. Dem Bericht zufolge haben die rassistischen Hooligans vom Klub ein Kontingent von 3000 Karten erhalten. Jerusalem-The Simon Wiesenthal Center today noted the passing of former Sobiboir death camp guard Ivan Demjanjuk in Germany at age 91, while awaiting an appeal of his conviction for accessory to murder for the deaths of the Sobibor inmates murdered while he served at the infamous Nazi death camp from March to September 1943. In a statement issued today by its chief Nazi-hunter, Israel director Dr. Efraim Zuroff, the Center noted that the length of the Demjanjuk case, which began in the United States in the late seventies and continued initially in Israel and later back in the US and then in Germany, unfortunately might have raised some doubt as his role during World War II, but there was never any doubt as far as the Center was concerned, that Demjanjuk had been an active participant in the implementation of the "Final Solution," the Nazis' plan to annihilate European Jewry.
" Ivan Demjanjuk died guilty of his service in the Sobibor death camp and that is how he should be remembered, not as a person falsely accused, but as an individual who volunteered to serve in the SS, and who at the height of his physical powers spent months helping to mass murder innocent Jews deported to that death camp. Justice was unfortunately delayed in this case, and hindered by complicating factors, but was ultimately achieved to the credit of the prosecutors in the US and Germany who handled the case." Berlin-The Simon Wiesenthal Center today launched "Operation Last Chance II," a project which will focus on the men who served in Nazi death camps and the Einsatzgruppen (special mobile killing units), at a press conference held at the Bundestag press lobby here today. 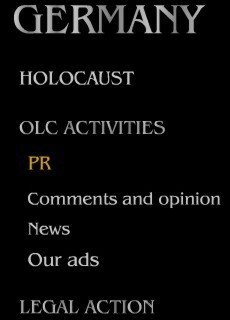 Modeled after its original "Operation Last Chance" project started in 2002, which focused primarily on Eastern Europe, the current initiative, which is supported by the "Targum Shlishi Foundation" of Miami headed by Aryeh Rubin, is offering financial rewards of up to 25,000 euros for information which will lead to the prosecution and punishment of Nazi war criminals.The Center's chief Nazi-hunter, Israel director Dr. Efraim Zuroff, who conceived and directs the new project, explained that the May 2011 conviction in Munich of Sobibor death camp guard Ivan Demjanjuk, who is the first person to be convicted in Germany without evidence of a specific crime with a specific vic tim, paves the way for the successful prosecution in Germany of any person who served in one of the death camps or the Einsatzgruppen. "The Demjanjuk conviction at long last enables the prosecution of individuals who were active participants in the mass murder of Jews on practically a daily basis for extended periods of time, but hereto for legal reasons could not be prosecuted for their crimes. This travesty of justice can now be corrected, but we are in a race against time to find the individuals still alive and expedite their prosecution. My estimate is that there are at least several dozen such cases which can still be brought to trial and we want to do whatever we can to help the German legal authorities bring these Holocaust perpetrators to justice." 100 euros a day for the first 150 days of imprisonment, for a total of an additional 15,000 euros.Total=25,000 euros. ברלין – מרכז שמעון ויזנטל השיק היום את "מבצע הזדמנות אחרונה II”, מיזם שיתמקד באנשים ששרתו במחנות מוות נאציים ובאיינזצגרופן (עוצבות מבצע מיוחדות), במסיבת עיתונאים שהתקיימה באולם העיתונות בבונדסטאג. דר' זורוף הסביר שהיוזמה ל"מבצע הזדמנות אחרונה II” באה בעקבות הרשעתו במינכן, גרמניה במאי 2011, של איבן דמיאניוק, שהיה שומר במחנה המוות סוביבור, ואשר היה האדם הראשון שהורשע בגרמניה ללא הוכחת עדות לפשע או קורבן מסוימים, ובכך סללה את הדרך להעמדה מוצלחת לדין בגרמניה של כל אדם ששרת באחד ממחנות המוות או בעוצבות המבצע. את הפרויקט המקורי של "מבצע הזדמנות אחרונה I” שנפתח בשנת 2002 והתמקד בעיקר במזרח אירופה, וכן את הפרויקט החדש, הגה וניהל דר' אפרים זורוף, מנהל מרכז ויזנטל בישראל וצייד הנאצים הראשי שלו. פרוייקט זה, כקודמו, נערך בשותפות עם אריה רובין, מנהל "קרן תרגום שלישי" ממיאמי, ארה"ב, ובו מוצע פרס של עד 25,000 יורו למוסר מידע שיוביל להעמדה לדין וענישה של פושעי מלחמה נאצים. כמו כן השתתפו במסיבת העיתונאים חבר הפרלמנט דיטמאר נייתאן, חבר הפרלמנט לשעבר גרט וויסקירשן והאקטיביסט נגד אנטישמיות יורג רנסמאן.
" הרשעתו, סוף סוף, של דמיאניוק מאפשרת את העמדתם לדין של אנשים שלקחו חלק פעיל ברצח ההמוני של יהודים באופן יום יומי לאורך זמן, אבל סיבות משפטיות מנעו את העמדתם לדין על פשעיהם. עיוות צדק נורא זה יתוקן עתה, אך אנו במרוץ נגד הזמן כדי למצוא את אלה שעדיין חיים ולהחיש את העמדתם לדין. להערכתי יש לפחות כמה עשרות אנשים שניתן עדיין להעמידם לדין ואנו רוצים לעזור למערכת המשפט הגרמנית, ככל יכולתנו, כדי להביא לדין צדק את פושעי השואה האלה." 100 יורו לכל יום מתוך 150 ימי המאסר הראשונים, ועד לסך של 15,000 יורו. Jerusalem/Muenster-The Simon Wiesenthal Center today called upon the German authorities to investigate the possibility that the same officials who either colluded with neo-Nazi terrorists or purposely ignored their criminal activities also conspired to prevent the prosecution of Nazi war criminals. In a statement issued today by its chief Nazi-hunter, Israel director Dr. Efraim Zuroff, and its chief researcher in Germany Dr. Stefan Klemp, the Center noted that unlike the situation in most of the other Laender, where numerous Nazi war criminals have been and/or are currently under investigation, in recent years there have no investigations whatsoever of Holocaust perpetrators in Thuringia.
" In the light of this week's revelations, we cannot totally discount the possibility that the same officials who colluded and/or turned a blind eye to neo-Nazi activity in Thuringia helped made sure that no Nazi war criminals would be investigated, let alone prosecuted. The urgent investigation into the serious crimes committed by the neo-Nazis should therefore also seriously consider the possibility that their activities included efforts to shield their ideological predecessors from the recently increasingly successful efforts in Germany to bring Nazi war criminals to justice." Jerusalem/Münster. Das Simon Wiesenthal Center hat heute die deutschen Behörden dazu aufgerufen, ihre Ermittlungen zum NS-Terror auszuweiten. Sie sollten auch die Frage beantworten, ob möglicherweise die gleichen Beamten, die entweder mit Neo-Nazi-Terroristen zusammenarbeiteten oder ihre kriminellen Aktivitäten ignorierten, auch an der Verhinderung der Strafverfolgung von NS-Verbrechern oder NS-Kriegsverbrechern beteiligt waren. In einer Stellungnahme, die heute vom Chef-Nazijäger des Wiesenthal Centers, Dr. Efraim Zuroff, und dem Researcher des Wiesenthal Centers in Deutschland, Dr. Stefan Klemp, herausgegeben wurde, stellte das Wiesenthal Center fest, dass anders als in den meisten Bundesländern, wo es eine ganze Reihe von Ermittlungsverfahren oder auch Gerichtsverfahren gegeben hat, in Thüringen in den letzten Jahren nicht nur keine NS-Täter vor Gericht gestellt wurden, sondern es auch keine Ermittlungsverfahren mehr gegeben hat. Den Haag. Das Simon Wiesenthal Center erhält die Unterstützung der großen Parteien des niederländischen Parlamentes im Fall Klaas Faber. Bei einem Treffen mit dem Nazijäger Dr. Efraim Zuroff sagten die Spitzen der vier größten Parteien des Landes ihre aktive Unterstützung im Bemühen um eine Bestrafung des verurteilten SS-Mannes zu. Faber verbringt seinen Lebensabend in Ingolstadt. Er war in den Niederlanden wegen mehrfachen Mordes zu lebenslanger Haft verurteilt worden. Ihm gelang jedoch die Flucht nach Deutschland. Die Bayerische Justiz lehnt weitere Ermittlungen gegen ihn ab. Zuroff und der niederländische Investigativjournalist Arnold Karskens trafen gestern zusammen mit Step Blok (Liberale), Gert Wilders (Freiheitspartei), Emile Roemer (Sozialdemokraten) und Jolande Sap (Grüne). Sie wollen gemeinsam den Druck auf Deutschland erhöhen, damit Faber endlich seiner gerechten Strafe zugeführt werden kann. Ziel ist es, dass er seine Haftstrafe verbüßt. Entweder nach einer Auslieferung in den Niederlanden oder in Deutschland. The Hague, Netherlands-The Simon Wiesenthal Center’s chief Nazi-hunter, Israel director Dr. Efraim Zuroff, met here yesterday with the leaders of the four largest parties in the Dutch Parliament to enlist their active support in the Center’s campaign to get Germany to take legal action against escaped convicted Dutch SS-executioner Klaas Carel Faber, who is currently living unpunished in Ingolstadt, Bavaria, having fled a Dutch prison, where he was serving a life sentence for the murder of dozens of resistance members, Jews, and those helping to hide Jews. Zuroff, along with local investigative journalist Arnold Karskens, who heads the Dutch Foundation for War Crimes Research and has played a major role in the Faber case, met here with Step Blok of the Liberal Party, Gert Wilders of the Freedom Party, Emile Roemer of the Social Democrats, and Jolande Sap of the Greens to urge increased pressure on Germany to either extradite Faber back to Holland to serve his sentence or incarcerate him in a German prison. Jerusalem-The Simon Wiesenthal Center has labeled a neo-Nazi march of approximately 1,000 participants held this past Jerusalem-The Simon Wiesenthal Center today strongly condemned a proposal submitted by the family of Latvian mass murderer Herberts Cukurs to bury their father’s remains in the “Brothers’ Cemetery” in Riga, the site of the burial of Latvia’s most important heroes. In a statement issued here by its Israel director, Holocaust historian Dr. Efraim Zuroff, the Center denounced the proposal as an attempt to absolve one of the biggest Latvian Nazi war criminals of his horrific crimes, which is an unforgivable insult to the memory of all the victims of the Holocaust and an affront to all Latvians with any sense of honesty and morality. Jerusalem-The Simon Wiesenthal Center called upon the German authorities to make a final effort to bring to justice two convicted but unpunished Nazi war criminals living in Germany and to open the files of the BND (German Secret Service) regarding the postwar escape of notorious Holocaust perpetrators. In an op-ed piece published today in the important German daily Sűddeutsche Zeitung, the Center’s chief Nazi-hunter Israel director Dr. Efraim Zuroff noted the recent revelations which indicate that the BND knew of the whereabouts of arch Nazi criminal Adolf Eichmann long before his capture in Argentina by Israeli Mossad agents, as proof of the significance of the files to which access has hereto been blocked. In addition, he emphasized the unresolved cases of Dutch Nazi SS executioner Klaas Carl Faber (living in Ingolstadt, Bavaria) and Danish SS officer Soern Kam (Kempten, Bavaria), both of whom were convicted in their countries of origin for murder, but have hereto eluded justice after escaping to Germany and being granted German citizenship. is an excellent opportunity to thank Germany for its improved record in bring Nazi war criminals to justice, but also to point to two important issues which require the attention of the German government. We very much hope that Faber and Kam, both of whom committed hands-on murder in the service of the Nazis, will not escape punishment and that the critical files on the postwar escape of major Nazi war criminals will finally be opened to historians and researchers. Jerusalem-The Simon Wiesenthal Center today called upon the German Security Service (BND) to open its files on escaped Nazi war criminals in the wake of recent revelations that the German authorities already knew of the whereabouts in Argentina of Adolf Eichmann in 1952, eight years before he was abducted by the Mossad to stand trial in Israel for his critical role in the implementation of the Final Solution. In a statement issued here by its chief Nazi-hunter, Israel director Dr. Efraim Zuroff, the Center noted the importance of such information, which clearly shows the utter indifference of the German authorities at that time to the necessity of bringing such key Holocaust perpetrators to justice. Jerusalem. Das Simon Wiesenthal Center hat heute den Bundesnachrichtendienst (BND) dazu aufgefordert, seine Akten über flüchtige NS-Verbrecher zu öffnen. Diese Forderung sei um so dringender, nachdem jetzt berichtet wurde, dass der deutsche Geheimdienst schon 1952, acht Jahre vor der Verhaftung von Adolf Eichmann im Jahr 1960, wusste, wo sich der Organisator des Holocaust in Argentinien aufhielt. In einer Stellungnahme unterstrich der Nazijäger und Leiters des Jerusalemer Büros des Wiesenthal Centers, Dr. Efraim Zuroff, die große Bedeutung solcher Informationen, die das Desinteresse deutscher Stellen bei der Strafverfolgung von NS-Tätern in den 1950er Jahren belegen. Jerusalem – The Simon Wiesenthal Center today called upon the German authorities to accede to a Dutch European arrest warrant issued yesterday for the incarceration of escaped Dutch SS-executioner Klaas Faber, currently residing in Ingolstadt, Bavaria, who is currently third on the Center’s list of “Most Wanted” Nazi war criminals. In a statement issued today by its chief Nazi-hunter, Israel director Dr. Efraim Zuroff, the Center noted that Faber, who was convicted in Holland for his role in the murder of 22 persons after the war, escaped in 1952 to Germany, which has hereto rejected Dutch extradition requests, since Faber was the beneficiary of the infamous “Fuhrer directive” of 1943 which granted automatic German citizenship to foreign Nazi collaborators. ירושלים – מרכז שמעון ויזנטל קרא היום לממשלת גרמניה להיענות מיד לדרישת הולנד מאמש ולעצור את התליין הנאצי ההולנדי הנמלט קלאס פאבר שחי כעת באינגולשטאדט, באווריה ומופיע כעת במקום שלישי ברשימת "10 הפושעים המבוקשים ביותר" של מרכז שמעון ויזנטל. צייד-הנאצים ומנהל המרכז בישראל, דר' אפרים זורוף, אמר היום שהמרכז מדגיש שפאבר, אשר הורשע בהולנד לאחר המלחמה על חלקו ברצח 22 אנשים , נמלט לגרמניה בשנת 1952, ועד כה דחתה גרמניה כל בקשת הסגרה הולנדית, כיוון שפאבר נהנה מ"פקודת הפיהרר" הידועה לשמצה שלפיה הוענקה אזרחות גרמנית באופן אוטומטי לכל משתף פעולה נאצי זר. "אנו מקדמים בברכה את צעדה של ממשלת הולנד ודוחקים בממשלת גרמניה לאסור את פאבר מיד כך שירצה סוף סוף את העונש המגיע לו. העובדה שרוצח המוני חפים מפשע זה קיבל הגנה מגרמניה במשך שנים רבות כל כך היא מצערת ביותר ומעבירה מסר שאפילו מי שכבר הורשע ברצח המוני יכול להימלט מהצדק. לקורבנותיו של פאבר, משפחותיהם ולחברה ההולנדית והגרמנית חשוב שפאבר יישא בעונש על פשעיו." Jerusalem – The Simon Wiesenthal Center today issued a statement in response to the death near Bonn of former Belzec death camp guard Samuel Kunz, who was indicted and awaiting trial for his role in the mass murder committed at the camp. The Center’s chief Nazi-hunter, Israel director Dr. Efraim Zuroff, expressed the deep frustration of having justice thwarted shortly before Kunz was scheduled to be brought to trial. דר' אפרים זורוף, צייד הנאצים הראשי של המרכז ומנהל המרכז בישראל , ביטא את תסכולו הרב על שהצדק לא בא לידי ביטוי ממש טרם העמדתו לדין של קונץ. "סמואל קונץ חי בגרמניה ולא הורשע במשך עשרות בשנים בשל מדיניות לקויה של העמדה לדין שהתעלמה למעשה ממעשיהם של פושעים שאינם קצינים. מדיניות זו, שהיה צריך לשנותה זה מכבר, שונתה רק לאחרונה, וכך התאפשר להרשיע את קונץ והגיעה ההזדמנות לדרוש ממנו לשאת בתוצאות פשעיו. אנו מבקשים משלטונות גרמניה לזרז את הטיפול בכל המקרים הדומים, בהתחשב בגילם המתקדם של החשודים, כך שניתן יהיה עדיין להשיג מידה כלשהי של צדק." Jerusalem. Das Simon Wiesenthal Center gab heute eine Stellungnahme zum Tod des ehemaligen Aufsehers des Todeslagers Belzec, Samuel Kunz, bei Bonn heraus. Kunz war angeklagt worden und wartete auf das Verfahren wegen seiner Teilnahme am Massenmord in dem Lager. Der Nazijäger und Leiter des Jerusalemer Büros des Wiesenthal Centers, Dr. Efraim Zuroff, brachte seine tiefe Frustration darüber zum Ausdruck, dass Kunz der Gerechtigkeit kurz vor Beginn des Gerichtsverfahrens entkommen ist. Jerusalem – The Simon Wiesenthal Center today welcomed the support of Israeli Justice Minister Yaakov Neeman who this week urged his German counterpart Sabine Leutheusser – Schnarrenberger to find a way to take action in the case of escaped convicted Dutch Nazi war criminals Klaas Carel Faber, currently residing in Ingolstadt, Bavaria. Since his escape to Germany in 1952 from a Dutch jail, where he was serving a life sentence for his alleged role in the murder of at least 11 civilians, Faber has been spared extradition to Holland and punishment in Germany due to legal technicalities. In a statement issued here today, the Center’s chief Nazi-hunter, Israel director Dr. Efraim Zuroff called upon the Bavarian judicial authorities to review the case and refrain from granting Faber judicial protection on the grounds that he was not an officer. Jerusalem. Das Simon Wiesenthal Center hat heute die Unterstützung des israelischen Justizminsters Yaakov Neeman begrüßt, der seine deutsche Kollegin Sabine Leutheusser-Schnarrenberger dazu aufgefordert hat, nach Wegen für eine Bestrafung des niederländischen NS-Täters Klaas Faber zu suchen. Faber war für seine Taten in den Niederlanden verurteilt worden, konnte sich der Haft aber durch Flucht entziehen und lebt heute in Ingostadt, Bayern. Seit seiner Flucht nach Deutschland im Jahr 1952 lebt er aufgrund von rechtlichen Problemen in Freiheit. In den Niederlanden war er wegen der Ermordung von mindestens elf Zivilisten zu einer lebenslangen Haftstrafe verurteilt worden. In einer Stellungnahme hat der Nazijäger und Direktor des Wiesenthal Büros in Israel, Dr. Efraim Zuroff, die bayerische Justiz dazu aufgerufen, den Fall zu überprüfen und den bisherigen Standpunkt zu revidieren, wonach Fabers Tatbeitrag wegen seiner „untergeordneten Rolle als Teilnehmer an einem Erschießungskommando nur als gering anzusehen“ sei und deshalb nicht als Mordtäter belangt werden könne. ירושלים – 150 עורכי דין ירושלמים חתמו על עצומה שהוגשה בשבוע שעבר לשר המשפטים יעקב נאמן, הקוראת לממשלת ישראל לדרוש מגרמניה לנקוט באמצעים משפטיים נגד התליין המורשע הנאצי קלאס פאבר, שמתגורר כיום, חופשי מעונש על פשעיו, באינגלשטאדט, גרמניה. העצומה שיזם וקידם עו"ד דויד שונברג, מבטאת את זעמם ותסכולם של עורכי הדין על כך שפאבר, אשר נדון למוות בהולנד על שורת מעשי רצח שביצע בעת שירותו בס.ס. אך הצליח להימלט לגרמניה ב 1952, חי ללא הרשעה וענישה בגרמניה עשרות בשנים, למרות שממשלת הולנד ביקשה מספר פעמים את הסגרתו לשם ריצוי העונש, שהומר בשנות הארבעים למאסר עולם. העצומה הוגשה כדי לתמוך במאמצים הבלתי נלאים של מרכז שמעון ויזנטל להעמיד את פאבר לדין וכדי לגייס את תמיכתה הפעילה של ממשלת ישראל במאמץ זה. כמו כן קוראת העצומה לממשלת ישראל לדרוש מגרמניה לבטל כל חוק קיים כגון "פקודת הפיהרר" הראויה לשמצה, שהעניקה אזרחות גרמנית למשתפי פעולה נאצים לא-גרמנים ומגן עליהם מהסגרה למדינתם כדי שניתן יהיה להרשיעם ו/או להענישם.
" ההגנה שהחוק הגרמני מעניק לפושע המלחמה המורשע הזה שמאפשרת לו לחיות ללא דאגות בגרמניה, היא עלבון לחוק ולערכים אנושיים, ועל ידי מיזעור פשעי השואה היא מעבירה מסר שלילי לחברה המודרנית. אנו מצפים מממשלתנו לקחת חלק פעיל יותר במאמצים להביא לדין פושעים נאצים וזה בדיוק סוג המקרים בהם מעורבות ישראל יכולה להיות משמעותית ביותר". דר' אפרים זורוף, צייד הנאצים ומנהל מרכז ויזנטל בישראל בירך על היוזמה והוסיף: "כישלונה של גרמניה עד כה להעמיד את פאבר לדין או להסגירו להולנד הוא שערורייה וחובה לתקן זאת מהר ככל האפשר, כל עוד ניתן להשיג צדק." כמו כן נתמכה העצומה על ידי מרכז הארגונים של ניצולי השואה ועל ידי יד ושם. Jerusalem. 150 örtliche Rechtsanwälte fordern in einer Eingabe die israelische Regierung dazu auf, in Deutschland rechtliche Schritte gegen den SS-Vollstrecker Klaas Faber zu erwirken, der in Freiheit in Ingolstadt lebt. Die Petition wurde gestern dem israelischen Justizminister Yaakov Ne’man übergeben. Initiator der Aktion ist der Anwalt David Schonberg. Er brachte den Ärger der Anwälte darüber zum Ausdruck, dass Faber, der in den Niederlanden für mehrere Morde zum Tode verurteilt wurde, seit Jahrzehnten unbestraft in Deutschland leben kann. Faber war 1952 nach Deutschland geflohen, das Todesurteil wurde später in eine lebenslange Haftstrafe umgewandelt. Mehrere niederländische Auslieferungsersuchen wurden in Deutschland abgelehnt. Mit der Beschwerde wollen die Anwälte die Bemühungen des Simon Wiesenthal Centers, Faber zur Verantwortung zu ziehen, unterstützen. Und man erhofft sich eine aktive Unterstützung der Aktion durch die israelische Regierung. Die Petition ruft die israelische Regierung auch dazu auf, die deutsche Regierung dazu zu bringen, Rechtsnormen wie den so genannten „Führerbefehl“ von 1943 zu ändern, der nichtdeutschen Kollaborateuren zur deutschen Staatsbürgerschaft verhilft und sie so vor einer Auslieferung in ihre Heimatländer schützt, wo sie rechtskräftig verurteilt worden sind. Der Leiter des Wiesenthal Centers in Jerusalem und Nazijäger Dr. Efraim Zuroff begrüßte die Initiative und fügte hinzu, dass „das Scheitern eines Prozesses gegen Faber in Deutschland und einer Auslieferung nach Holland ein Unrecht ist, das so schnell wie möglich korrigiert werden muss, so lange noch Gerechtigkeit erreicht werden kann.“ Die Petition wird auch unterstützt von der Organisation der Holocaust-Überlebenden und von Yad Vashem. Jerusalem-A petition signed by 150 local lawyers calling upon the Israeli government to urge Germany to take legal action against convicted Nazi SS executioner Klaas Faber, who is currently residing unpunished for his crimes in Ingolstadt, Bavaria, was submitted late yesterday to the office of Israeli Justice Minister Yaakov Ne’eman. The petition, which was initiated and organized by Advocate David Schonberg, expressed the lawyers’ sense of outrage that Faber, who was sentenced to death in Holland for a string of murders he carried out in the service of the SS but who escaped to Germany in 1952, has been living unprosecuted and unpunished in Germany for decades, despite several requests from the Dutch government for his extradition to serve his sentence, which had been commuted in the late 40’s to life imprisonment. The petition was submitted in support of the ongoing efforts of the Simon Wiesenthal Center to bring Faber to justice, and to enlist the active support of the Israeli government in this case. It also calls for the Israeli government to urge Germany to cancel any existing laws, such as the infamous “Fuhrer befehl”, which granted German citizenship to local non-German Nazi collaborators and protected them from extradition to their countries of origin to face prosecution and/or punishment. According to Advocate Schonberg: “The protection that German law accords this convicted war criminal, enabling him to live untroubled in Germany is an affront to law and human values, and by its belittling of the enormity of the holocaust’s crimes, provides a harmful message to modern society. We expect our government to take a more active role in the efforts to bring Nazi war criminals to justice and this is exactly the type of case where Israel’s involvement can prove of critical assistance”. The Wiesenthal Center’s chief Nazi-hunter Dr. Efraim Zuroff welcomed the initiative and added that “Germany’s failure hereto to put Faber on trial or return him to Holland are a travesty which must be corrected as quickly as possible, while justice can still be achieved.” The petition also has the support of the Center of Organizations of Holocaust survivors and Yad Vashem. Jerusalem. Das Simon Wiesenthal Center brachte heute seine Enttäuschung angesichts des Todes des des SS-Führers und Polizeihauptmanns Erich Steidtmann zum Ausdruck, der während des II. Weltkriegs als Offizier mehrerer Polizeibataillone am nationalsozialistischen Massenmord an Juden in Osteuropa beteiligt war, aber nicht für seine Taten zur Rechenschaft gezogen wurde. In einer Stellungnahme, die heute vom Leiter des Jerusalemer Büros des Centers, Dr. Efraim Zuroff veröffentlicht wurde, heißt es, dass Steidtmanns Tod jahrzehntelange Versäumnisse der deutschen Justiz bei den Ermittlungen in diesem Fall belegt. Schon in den 1960er Jahren war mehrfach gegen ihn ermittelt worden, die Verfahren wurden jedoch trotz guter Beweislage eingestellt. Jerusalem-The Simon Wiesenthal Center today expressed its frustration and disappointment in the wake of the death earlier this week in Hannover of former Nazi police battalion commander Erich Steidtmann, who led several police battalions which actively participated in the mass murder of numerous Jews in eastern Europe, before he could be prosecuted for his crimes. In a statement issued here today by its chief Nazi-hunter, Israel director Dr. Efraim Zuroff, the Center noted that Steidtmann’s death unprosecuted reflected a decades-long failure by the German judicial authorities in his case, which was opened as early as the sixties, but was closed then for lack of evidence. Jerusalem – The Simon Wiesenthal Center expressed deep satisfaction in the wake of the conviction today of Dutch Nazi war criminal Heinrich Boere in a court in Aachen, Germany. Boere, who served in the Dutch “Silbertanne” SS murder squad, was sentenced to life imprisonment for the murder of three Dutch civilians suspected by the Nazis of hiding Jews and/or helping the resistance. In a statement issued in Jerusalem, the Center’s chief Nazi-hunter, Israel director Dr. Efraim Zuroff, praised the efforts of prosecutor Ulrich Maas and noted the significance of the trial which proved that Holocaust perpetrators could still be held accountable for their crimes. Jerusalem-The Simon Wiesenthal Center welcomed the opening today in Aachen, Germany of the trial of former Dutch Nazi SS executioner Heinrich Boere who is accused of the murder of three Dutch civilians during World War II as a member of the “Silbertanne” SS execution squad which operated in the Netherlands. In a statement issued today in Jerusalem by it chief Nazi-hunter, Israel director Dr. Efraim Zuroff, the Center noted that Boere, who escaped to Germany soon after the war, had been sentenced to death by a Dutch court in 1949 but had been spared extradition due to the fact that he had been granted German citizenship on the basis of his collaboration with the Nazis during World War II. “The prosecution of Heinrich Boere sends a very powerful message that the passage of time in no way diminishes the guilt of the murderers and that elderly age should not protect the killers of innocent civilians. Boere’s victims and their families are just as worthy of obtaining justice today as they were right after he committed his crimes. Jerusalem – The Simon Wiesenthal Center today urged the German judicial authorities to take all necessary measures to prevent the escape of Nazi war criminal Josef Scheungraber who was convicted two days ago in Munich for his role in the murder of civilians in Falzano di Cortona, Italy in June 1944. In a statement issued in Jerusalem by its chief Nazi-hunter, Israel director Dr. Efraim Zuroff, the Center pointed to Scheungraber’s derisive comments in the wake of his verdict which he called “a swindle” and noted that other Nazi criminals even older than Scheungraber, like Croatian Milivoi Ašner, had successfully escaped justice by fleeing their county of origin. Jerusalem. Das Simon Wiesenthal Center hat heute die deutschen Behörden dazu aufgefordert, alle notwendigen Maßnahmen zu ergreifen, um eine mögliche Flucht des verurteilten NS-Kriegsverbrechers Josef Scheungraber zu verhindern. Scheungraber war wegen seiner Beteiligung an der Ermordung von Zivilisten in Falzano di Cortona im Juni 1944 verurteilt worden. In einer Stellungnahme wies der Direktor des Wiesenthal Centers in Jerusalem, Dr. Efraim Zuroff, auf Scheungrabers abfällige Kommentare zu dem Urteil hin, das er als „Schwindel“ bezeichnete und das Gericht zudem als „Saustall“ titulierte. Ferner nannte Zuroff das Beispiel des kroatischen Kriegsverbrechers Milivoj Asner, der 2005 im Alter von 92 Jahren von Kroatien nach Österreich geflohen war, wo er seitdem seinen Lebensabend genießt. Obwohl älter als Scheungraber, gelang ihm die Flucht. „Angesichts Scheungrabers Beschimpfung des Gerichts und des Urteils kann es nicht ausgeschlossen werden, dass auch er in ein Land fliehen will, das nicht so großen Wert auf die Strafverfolgung von NS-Verbrechern legt. Deswegen fordern wir die deutschen Behörden dazu auf, alle möglichen Maßnahmen zu ergreifen, damit er seiner gerechten Strafe nicht entgeht“, so Zuroff. ירושלים - מרכז שמעון ויזנטל בירך היום על החלטתו של בית המשפט במינכן להרשיע את קצין הוורמכט לשעבר, סגן יוסף שונגראבר על חלקו בעשרה מקרי רצח בעת הוצאה להורג של אזרחים בפאלזאנו די קורטונה, איטליה ביוני 1944. "גזר הדין שניתן היום נותן תוקף מחודש לעקרונות החשובים שהזמן החולף אינו ממעיט מאשמתם של הפושעים ושגיל מבוגר לא יכול להוות הגנה חוקית לרוצחים. בהקשר לכך, קורבנות פאלזאנו די קורטונה ראויים לכך שרוצחיהם ייענשו היום לא פחות מאשר אילו היו נענשים בשנת 1944." Jerusalem – The Simon Wiesenthal Center welcomed the conviction today in a Munich court of former Wehrmacht lieutenant Josef Scheungraber on ten counts of murder for his role in the reprisal executions of civilians in Falzano di Cortona, Italy in June 1944. In a statement issued by its chief Nazi-hunter, Israel director Dr. Efraim Zuroff, the Center praised the renewed efforts of the German judiciary to prosecute World War II criminals and noted the importance of these trials. Jerusalem. Das Simon Wiesenthal Center hat heute die Entscheidung begrüßt, wonach der in den Niederlanden bereits verurteilte NS-Täter Heinrich Boere nun doch in Deutschland zur Verantwortung gezogen werden kann. Der Leiter des Wiesenthal-Zentrums in Jerusalem, Dr. Efraim Zuroff, sagte, es sei wichtig, dass Heinrich Boere angesichts seines hohen Alters möglichst schnell vor Gericht gestellt wird. Die Zentralstelle bei der Staatsanwaltschaft Dortmund für die Bearbeitung von NS-Verbrechen hat gegen Heinrich Boere Anklage wegen dreifachen Mordes erhoben. Als Angehöriger der Waffen-SS hatte Boere in den Niederlanden drei Männer erschossen. In seiner Heimat war er deswegen zu lebenslänglicher Haft verurteilt worden. Als deutscher Staatsbürger wird er nicht ausgeliefert, das holländische Urteil wird in Deutschland nicht vollstreckt. Ein Gutachter hatte ihn Anfang dieses Jahres für verhandlungsunfähig erklärt, das Landgericht Aachen einen Prozess abgelehnt. Diese Entscheidung wurde nun durch das Oberlandesgericht in Köln revidiert. GENERALSTAATSANWALT: WER SAGT IM FALL HEIM DIE UNWAHRHEIT? Jerusalem. Das Simon Wiesenthal Center hat heute beim Generalstaatsanwalt in Berlin Anzeige erstattet. Hintergrund sind die unerklärlichen Widersprüche in Aussagen zur Frage, ob der ehemalige KZ-Arztes Dr. Aribert Heim noch lebt oder schon tot ist. Während sein Sohn Rüdiger im Februar im ZDF erklärt hatte, sein Vater sei bereits 1992 in Ägypten verstorben, ist derzeit beim Bundesfinanzhof immer noch ein Verfahren anhängig, bei dem die Frage geklärt werden soll, ob Dr. Aribert Heim Kapitalertragssteuern für sein Berliner Millionenvermögen zahlen muss. Das Wiesenthal Center dazu: „Wenn Dr. Heim tatsächlich 1992 in Ägypten verstorben sein sollte, dann kann sein Anwalt Steinacker nicht regelmäßig mit ihm Kontakt gehalten haben.“ Es bestehe der Verdacht auf Falschaussage. Angesichts des großen öffentlichen Interesses, welches dieser Fall auf sicht zieht, hält das Wiesenthal Center nicht nur eine Klärung der Frage für dringend erforderlich, wie die Aussage der Anwälte vor Gericht rechtlich zu bewerten ist, sondern auch des gesamten Sachverhaltes vor dem Hintergrund der Fernsehberichterstattung über den angeblichen Tod Heims. Jerusalem. Nachdem das Simon Wiesenthal Center heute zunächst seine tiefe Besorgnis wegen der andauernden Verzögerungen beim Auslieferungsverfahren des ehemaligen Wachmanns im Todeslager Sobibor, Ivan Demjanjuk, zum Ausdruck gebracht hatte, begrüßt es jetzt die Entscheidung des Münchener Amtsgerichts, wonach endlich ein Haftbefehl gegen Demjanjuk erlassen wurde. Das Wiesenthal Center hatte die „Verzögerungen“ durch die bayerische Justiz kritisiert. Die Staatsanwaltschaft München hatte zunächst die Zuständigkeit abgelehnt. Dann war ein umfangreiches gutachterliches Verfahren eingeleitet worden. Jetzt drängt der Leiter des Wiesenthal Centers in Jerusalem, Dr. Efraim Zuroff, darauf, dass Demjanjuks Auslieferung „schnell“ in die Wege geleitet wird und es nicht weitere Verspätungen gibt. Jerusalem-The Simon Wiesenthal Center today expressed deep concern regarding the continuous delays in the exrtraditon of former Sobibor death camp guard Ivan Demjanjuk from the United States to Germany to stand trial for his complicity in the murder of 29,000 Jews in that camp. In a letter sent today to leading Bavarian officials Governor Horst Seehofer and provincial Justice Minister Dr. Beate Merk, as well as the attorneys in charge of the case, by its chief Nazi-hunter, Israel director Dr. Efarim Zuroff, the Center noted that Germany's Zentrale Stelle, which investigates Nazi war crimes had completed its examination of the Demjanjuk case months ago and had unequivocally recommended his extradition and prosecution in Munich, but the Bavarian judicial authorities had still not taken the necessary measures to bring Demjanjuk to justice.
" The passage of time in no way diminishes the guilt of the perpetrators and in a case like this, of a mass murderer who shares responsibility for the annihilation of so many innocent victims, it is especially important that he be brought to trial as quickly as possible, while justice can still be achieved.
" In that respect, the Bavarian judicial authorities and the court in Munich have an important opportunity to send a very powerful message about the necessity of pursuing Holocaust perpetrators and holding them accountable for their crimes, a message which continues to be timely and important throughout the world even, and perhaps especially, today.
" We therefore urge you to take whatever steps are necessary to help expedite the extradition to Germany of Ivan Demjanjuk to to face trial in Munich at the earliest possible date." Jerusalem-The Simon Wiesenthal Center today called upon the German Foreign Ministry to fully investigate the failure of its representatives to report the whereabouts in Egypt of the world's most wanted Nazi war criminal Dr. Aribert Heim and thereby facilitate his capture. In the wake of the recent findings by the New York Times and German Channel Two ZDF which prove that Heim submitted an application to extend his stay in Egypt in 1981, it is clear that representatives of the German Embassy in Cairo most likely were aware of the Nazi war criminal's residence in Egypt as early as that year, but apparently failed to report this fact to the German judicial authorities, despite the existing arrest warrant for Heim's arrest. It is also possible that local German diplomats may have been informed of Heim's demise, if he did indeed die in Egypt in 1992, a fact which, in the Center's opinion, has still not been conclusively proven. In a statement issued here today by its chief Nazi-hunter, Israel director Dr. Efraim Zuroff, the Center called for a thorough investigation by the Foreign Ministry of the role of its Cairo Embassy during the more than three decades that Heim apparently lived in Egypt, along with numerous other Nazi war criminals who were never brought to justice. Jerusalem. Das Simon Wiesenthal Center hat heute das deutsche Außenministerium dazu aufgefordert, das Versagen seiner Mitarbeiter bei der Fahndung nach Aribert Heim in Ägypten zu untersuchen. Der wegen mehrfachen Mordes gesuchte KZ-Arzt und SS-Führer hatte jahrelang in Ägypten gelebt, ohne dass dies irgendwelche Konsequenzen gehabt hätte. Dabei belegen die jüngsten Recherchen des ZDF und der New York Times, dass die deutsche Botschaft bei der Verlängerung seiner Aufenthaltsgenehmigung in Kairo im Jahre 1981 höchstwahrscheinlich davon erfuhr, dass er in Kairo lebte. Das Dokument trägt seine deutsche Passnummer und vermerkt seine deutsche Staatsangehörigkeit. Den Beamten hätte eigentlich auffallen müssen, dass Heim zur Fahndung ausgeschrieben war. Spätestens beim angeblichen Tod von Aribert Heim im Jahre 1992 hätte die Botschaft in Kairo wach werden müssen. Wenn die Angaben der Zeugen stimmen, dann wurde ein Vertreter der Botschaft ans Sterbebett von Aribert Heim gerufen. Seine Aufgabe wäre es gewesen, den Todesfall zu registrieren. Spätestens hier hätte es auffallen müssen, dass es sich bei dem vermutlichen Toten um den wegen Mordes weltweit gesuchten Mann handelte. In einer Stellungnahme hat der Nazijäger und Leiter des Jerusalemer Büros des Wiesenthal Centers eine gründliche Untersuchung der Rolle der Botschaft in Kairo durch das deutsche Außenministerium verlangt. Es müsse geklärt werden, wie es möglich war, dass Aribert Heim 30 Jahre in Ägypten leben konnte, obwohl er seine Identität nur dürftig verschleiert hatte. Neben Heim lebte eine ganze Reihe von anderen NS-Verbrechern in Ägypten. Jerusalem-The Simon Wiesenthal Center today expressed its “deepest frustration” in the wake of a decision by a German court not to proceed on medical grounds with the prosecution of Dutch SS executioner Heinrich Boere, who was finally indicted last year for his role in the murder of three civilians in the Netherlands during World War II. A member of the SS Silbertanne commando, Boere was convicted and sentenced to death in The Hague in 1949, but he escaped to Germany, where he lived unprosecuted for decades. In a statement issued here today, the Center’s chief Nazi-hunter, Israel director Dr. Efraim Zuroff, severely criticized the German judiciary’s failure in this and many similar cases of non-German Nazi collaborators, who committed terrible crimes in their native countries and were able to escape justice by fleeing to Germany, where they had been granted citizenship by order of Hitler. Zuroff also emphasized the failure of the German authorities to give the cases of Holocaust perpetrators the priority they deserved, which would have significantly reduced the number of suspects spared for reasons of ill health. Jerusalem. Das Simon Wiesenthal Center hat heute seine „tiefste Frustration“ über die Entscheidung des Schwurgerichts Aachen (NRW) zum Ausdruck gebracht, wonach der holländische SS-Vollstrecker Heinrich Boere wegen Verhandlungsunfähigkeit nicht vor Gericht gestellt wird. Boere war im vergangenen Jahr endlich wegen seiner Teilnahme an der Ermordung von drei Zivilisten in den Niederlanden angeklagt worden. Als Angehöriger des SS-Kommandos „Silbertanne“ hat er Angehörige des Widerstands erschossen. Boere war in Den Haag 1949 in Abwesenheit zum Tode verurteilt worden. Aber ihm gelang die Flucht nach Deutschland, wo er bis heute unbestraft lebt. In einer Stellungnahme übte der Nazijäger und Direktor des Wiesenthal Centers in Jerusalem, Dr. Efraim Zuroff, harte Kritik am Scheitern der deutschen Justiz in diesem und vielen ähnlichen Fällen von nichtdeutschen Nazi-Kollaborateuren, die in ihren Heimatländern grausame Verbrechen verübt hatten und der Gerechtigkeit durch Flucht nach Deutschland entkamen, wo sie aufgrund eines Erlasses von Adolf Hitler die deutsche Staatsbürgerschaft erhielten. Zuroff hob auch das Versäumnis der deutschen Strafverfolgungsbehörden hervor, die diesen Fällen nicht die notwendige Priorität eingeräumt haben, so dass eine hohe Zahl von Beschuldigten wegen ihres hohen Alters und angegriffener Gesundheit straffrei davonkommt. Dr. Efraim Zuroff, director of the Wiesenthal Center in Jerusalem who is actually staying in Berlin, says: "We urge the German Government to expedite this case as quickly as possible so that Demjanjuk can be fully punished for his crimes"
Puerto Montt, Chile – The Simon Wiesenthal Center announced today that it had already received new information regarding the possible whereabouts of its “Most Wanted” Nazi war criminal Dr. Aribert Heim, in the framework of the launch of the latest stage in its “Operation: Last Chance” project. In a press conference held here today by its chief Nazi hunter, Israel director Dr. Efraim Zuroff, and its Latin American director Sergio Widder, the Center's officials stated that since announcing its new ad campaign for “Operation: Last Chance” in Santiago on Tuesday, it had received two important tips regarding the possible whereabouts of Dr. Heim in Chile. Vor Jahren hatte das Wiesenthal Center die bayerische Justiz dazu aufgefordert, das Beweismaterial gegen Dr. Sewering nicht länger zu ignorieren und ihn vor Gericht zu stellen. Hans-Joachim Sewering hatte in den Kriegsjahren sechs bis acht Patienten der Heilanstalt Schönbrunn schriftlich in die Krankenmord-Anstalt Eglfing-Haar überwiesen. Drei von ihnen wurden dort ermordet. Jerusalem – The Simon Wiesenthal Center of Jerusalem today called upon the German Association of Internists (Bundesverband Deutscher Internisten – BDI), to withdraw the medal it recently awarded to Dr. Hans-Joachim Sewering, who was an active participant in the Nazis’ infamous euthanasia program which resulted in the mass murder of at least 100,000 chronically ill, handicapped, and mentally ill civilians. For years, the Center has been urging the German authorities to prosecute Sewering for his role in killing patients of the Schoenbrunn Hospital as part of the Nazis’ euthanasia program. In a statement issued today in Jerusalem by its chief Nazi-hunter, Israel director Dr. Efraim Zuroff, the Center accused Sewering of lying about his role in the murders and his claim that he did not know what fate awaited his patients. For further information: Call 972-50-721-4156. Jerusalem-The Simon Wiesenthal Center’s chief Nazi-hunter, Israel director Dr. Efraim Zuroff, responded today to a decision by a Leipzig court to allow the publication of a memoir by a Gestapo secretary in which she mentioned her former lover Erich Steidtmann, whose service as an officer in a unit which carried out killing operations in the Warsaw Ghetto was thereby exposed, as another proof of the relative failure of the German judicial authorities to bring Holocaust perpetrators to justice in the Federal Republic. Jerusalem - The Simon Wiesenthal Center welcomed the announcement made public today by the Austrian Justice Ministry on its official website, that it was offering the sum of 50,000 euros for information which would lead to the capture of the number one and number two "Most Wanted" escaped Nazi war criminals Alois Brunner and Dr. Aribert Heim. Brunner, who was last seen alive in 2001 in Syria, where he has enjoyed the full protection of the Syrian government for decades, was responsible for the deportation to death camps of 128,500 Jews from Austria [47,000], Greece [44,000], France [23,500], and Slovakia [14,000]. Heim, whose current whereabouts are unknown but is presumed to be living in Spain or South America, murdered hundreds of inmates of the Mauthausen concentration camp by injecting phenol into their hearts. In early 2006, the Center's chief Nazi-hunter, Israel director, Dr. Efraim Zuroff, met in Vienna with the Austrian ministers of justice and the interior to ask the Austrian government to match the prize of 130,000 euros being offered by the German government for information leading to the capture of Heim which the Wiesenthal Center had matched. Thus the Austrian prize brings the reward being offered for information which will facilitate the arrest of Heim to a total of 310,000 euros. Zuroff noted that in the past financial rewards offered for assistance in the capture of Nazi war criminals had proven critical, as in the case of notorious camp commander Josef Schwammberger whose arrest in Argentina was facilitated by a similar reward offered by the German government.
" We congratulate the Austrian authorities for joining in the important efforts to bring these leading Nazi war criminals to justice and hope that the added prize money will help make the difference in their apprehension. The passage of time in no way diminishes the crimes committed by Brunner and Heim and therefore their prosecution remains just as important, if not even more important, today than it would have been years ago." Jerusalem-The Simon Wiesenthal Center today reissued its call to the Austrian government to join with the German authorities and the Wiesenthal Center in the financial reward currently being offered to solicit information which would lead to the capture and trial of escaped Nazi war criminal Dr. Aribert Heim, who murdered hundreds of inmates with lethal injections of phenol to the heart in the Mauthausen concentration camp in Austria in1941. In a statement issued today in Jerusalem, the Center’s chief Nazi-hunter Israel director Dr.Efraim Zuroff noted that almost a year and a half had passed since his meetings in Vienna with the Austrian ministers of justice and the interior, both of whom stated that the government’s participation in such a reward was legally possible, yet despite the passage of so much time on a matter of such urgency, no answer had yet been received. Jerusalem – The Simon Wiesenthal Center today welcomed the decision yesterday by military judge Isacco Giorgio Guistiniani suspending the permission granted last week to convicted Nazi war criminal Erich Priebke to go to work in his lawyer’s office in Rome. In a statement issued in Jerusalem, the Center’s chief Nazi-hunter Israel director Dr. Efraim Zuroff reiterated the Center’s ironclad opposition to the granting of any privileges to convicted Nazi war criminals. “Unrepentant Nazi murderers do not deserve any privileges, consideration or sympathy, regardless of their age. People who executed civilians and had no mercy on their innocent victims do not deserve to be treated with kindness,” said Zuroff. Wiesenthal Center on Decision to Allow Convicted Nazi War Criminal Erich Priebke to Work: "Outrageous, Senseless and Insensitive"
Jerusalem – The Simon Wiesenthal Center today harshly criticized the decision taken yesterday by an Italian military judge to allow convicted Nazi war criminal Erich Priebke to work despite his being under house arrest for his role in the murder of three hundred and thirty-five Italian civilians in the Ardeatine caves outside Rome in March 1944. Jerusalem. Das Simon Wiesenthal Center hat heute die Entscheidung des Landratsamtes in Garmisch-Partenkirchen kritisiert, das eine Gedenkveranstaltung für Opfer des Nationalsozialismus am Pfingstwochenende am Hohen Brendten in Mittenwald verboten hat. Die Arbeitskreise „Distomo“ und „Angreifbare Traditionspflege“ hatten dort eine Kundgebung angemeldet, um der Opfer deutscher Gebirgstruppen des Zweiten Weltkrieges zu gedenken. Gleichzeitig findet dort eine Versammlung des „Kameradenkreises der Gebirgstruppe“ statt. „Es ist nicht fair, eine Gedenkveranstaltung zugunsten der Opfer zu verbieten, während Angehörige von Nazi-Truppenverbänden, die schwere Verbrechen begangen haben, wie ehrbare Bürger behandelt werden“, kritisiert der Leiter des Wiesenthal Centers in Jerusalem, Dr. Efraim Zuroff. Veteranen der belasteten Gebirgstruppen müssten die Konfrontation mit ihren Gegnern aushalten, zumal sie sich nie für ihre Untaten entschuldigt hätten, so Zuroff. Jerusalem-The Simon Wiesenthal Center today renewed its call for the resignation of Baden-Wűrttemburg governor Gűnther Oettinger in the wake of new revelations concerning his extremist right-wing sympathies. The Center had originally called for his resignation earlier this month, in the wake of his eulogy for his predecessor Hans Filbinger, whose Nazi past and war crimes as a Nazi judge who sentenced numerous innocent people to death, Oettinger chose to ignore. According to the Center’s chief Nazi-hunter, Israel director Dr. Efraim Zuroff, Oettinger’s apology for whitewashing Filbinger’s Nazi past rings extremely hollow given his continued membership in the “Studienzentrum Weikersheim,” a right-wing academic center founded by Filbinger which regularly invites speakers with extremist, and in certain cases anti-Semitic, views to deliver public lectures. Thus one of those scheduled to speak there is Martin Hohmann, who was expelled from the CDU for anti-Semitic statements. In addition, according to press reports, Oettinger regularly sings the currently-illegal first stanza of the Nazi-era national anthem “Deutschland Deutschland über alles,” which speaks of a territorially much-expanded Germany, a clear reflection of his ultra-nationalist sympathies. “If we add his most recent statement to his old student association in which he praised the advantages of going to war and bemoaned the lack of any imminent conflict, it becomes crystal-clear that Mr. Oettinger is clearly unsuited for the responsibility of leading Baden-Wűrttemburg,” said Zuroff. Jerusalem. „Die aktuellen Äußerungen des baden-württembergischen Ministerpräsidenten Günther Oettinger, der die NS-Vergangenheit seines Vorgängers Hans Filbinger rechtfertigte, sind absolut unfassbar.“ Das Simon Wiesenthal Center schließt sich den Rücktrittsforderungen an. „Ein Ministerpräsident, der die Nazi-Vergangenheit des ehemaligen Ministerpräsidenten und NS-Marinerichters Hans Filbinger leugnet und reinwäscht, ist untragbar“, sagte der Direktor des Centers in Jerusalem, Dr. Efraim Zuroff. Laut Efraim Zuroff ist es an der Zeit, einen deutlichen Trennstrich gegenüber nationalsozialistischen Kriegsverbrechen zu ziehen. In the wake of the refusal earlier this week by a Munich court to approve the extradition to Denmark of Danish Nazi war criminal Soeren Kam for the murder of a Danish anti-Nazi newspaper editor, the Simon Wiesenthal Center today urged the Danish Justice Ministry to attempt to achieve Kam’s extradition to stand trial in Copenhagen on the basis of his role in facilitating the deportation of hundreds of Danish Jews to Nazi concentration camps in the fall of 1943. In a letter sent today to Danish Justice Minister Lene Espersen, the Center’s chief Nazi-hunter, Israel director Dr. Efraim Zuroff, praised Danish efforts to bring Kam to justice and urged the Danish authorities to seek his extradition on the basis of different crimes than those which were the basis for the original Danish extradition request. In his letter to the minister, Zuroff noted that it Soeren Kam who, together with two accomplices, stole the registry of the Danish Jewish community in late summer 1943 in order to facilitate the roundup and deportation to concentration camps of all its members which took place in October of the same year. Thanks to the efforts of the Danish underground, most of the Jewish community escaped to Sweden, but 472, mostly elderly, Jews were arrested and deported to Nazi concentration camps, where dozens were murdered or died due to the inhuman conditions. “Soeren Kam was one of the persons who stole the registry of the names and addresses of the members of the Jewish community of Denmark shortly before the roundup of the Jews to deport them to Nazi concentration camps was to begin. This criminal act, which under the historical circumstances of World War II clearly constituted accessory to murder, should serve as the basis for a renewed attempt to bring Kam to justice in Copenhagen. It was this theft which directly facilitated the deportation of 472 Jews from Denmark to Nazi concentration camps, where 55 of them were murdered or died of the inhuman conditions. Jerusalem-The Simon Wiesenthal Center today protested the decision of a Munich court to refuse a long-standing Danish request for the extradition of Danish Nazi collaborator Soeren Kam who is wanted in Denmark for the murder in Copenhagen 1943 of Carl Henrik Clemmensen, a Danish anti-Nazi newspaper editor. In a statement issued today in Jerusalem, the Center's chief Nazi-hunter, Israel Director Dr. Efraim Zuroff, called the decision "yet another case of misplaced German judicial sympathy for a despicable Nazi collaborator who faithfully served the Third Reich." The Center urged the Danish authorities to appeal the verdict and renew the efforts to bring Kam to justice in the country in which he committed his crimes. "As problematic as this decision is, it might have been understandable, if the Germans were willing to prosecute Kam in Germany for his crime, but the exact opposite has been the case. For years, the German judicial authorities have refused to press charges against him and have done everything in their power to help this murderer elude justice. 1. The passage of time in no way diminishes the guilt of Nazi war criminals. 2. The fact that a Nazi war criminal reaches an elderly age does not turn him or her into a Righteous Gentile. We hope therefore that a way can be found to hold Soeren Kam accountable for his crimes." ירושלים – מרכז שמעון ויזנטל מחה היום על החלטת בית משפט במינכן שלא להיענות לבקשת דנמרק, שהוגשה זה מכבר, להסגרת פושע המלחמה הדני, משתף הפעולה סורן קאם (Soeren Kam ) אשר מבוקש בדנמרק בשל מעורבותו ברצח קארל הנריק קלמנסן, עורך עיתון דני אנטי-נאצי, בקופנהגן בשנת 1943ל. הזמן החולף אינו ממעיט כהוא זה מאשמתם של פושעי המלחמה הנאצים. פושע נאצי שהגיע לגיל מופלג אינו הופך להיות חסיד אומות העולם. לכן אנו מקווים שתימצא הדרך בה ישא סורן קאם באחריות על פשעיו." The Simon Wiesenthal Center today welcomed the decision of Nobel Prize winner Günter Grass to grant access to all documents related to his wartime service in the Waffen-SS in response to a request to that effect made last week by the Center’s chief Nazi-hunter Israel director Dr. Efraim Zuroff. At the same time, the Center reiterated its original request to Grass that he personally provide complete details on his World War II service in the wake of the growing confusion generated by recent conflicting revelations in the German media. The Simon Wiesenthal Center today called upon German author Günter Grass to make public all the pertinent details regarding his service in the Waffen-SS and grant researchers from the Center access to all documents concerning his World War II past. In a letter sent from Jerusalem by the Center’s chief Nazi-hunter, Israel director Dr. Efraim Zuroff, to the Nobel Prize winning author, Zuroff asked Grass to clarify contradicting details which have appeared in the media following his revelation earlier this month that he had served in the Waffen-SS during the last year of World War II. He also requested that Grass allow Wiesenthal Center researchers to examine his personal documents in various German archives to which access is not granted without the subject’s permission. Zuroff added that a special task force for the capture of Dr. Heim, which had been established by the German police, was currently conducting an intensive manhunt in Spain and in South America, based on information received from informants to various sources, including the Wiesenthal Center . לדברי זורוף אמרה שרת הפנים פרוקופ שבאופן תיאורטי יכולה הממשלה להכריז על פרס כזה והיא תציג את ההצעה בפניה לשיקול דעת. זורוף הדגיש שהזמן דוחק ושיש משמעות סמלית להעמדת היים לדין כ"דוגמה לנאצי שניצל לרעה באופן חולני את הרפואה." זורוף הוסיף שממשלת גרמניה הקימה כוח משימה מיוחד למטרת לכידת דר' היים וכעת מבצע כוח זה חיפוש אינטנסיבי בספרד ודרום אמריקה, בהתבססו על מידע שהתקבל ממקורות שונים, כולל מרכז שמעון ויזנטל. The Simon Wiesenthal Center today called upon the Austrian government to match a reward of 130,000 euros currently being offered by the German government for information which will facilitate the capture of escaped Nazi war criminal Dr. Aribert Heim who murdered hundreds of inmates at the Mauthausen ( Austria ) concentration camp. In a letter sent today to Austrian Justice Minister Karin Gastinger, the Center's chief Nazi-hunter Israel director Dr. Efraim Zuroff urged the Austrian government to do its share in the renewed efforts currently being made by the German authorities to track down Heim, who is listed by the Wiesenthal Center as the second most wanted unprosecuted Nazi war criminal alive today (after Eichmann's top assistant Alois Brunner). "Given that Heim was born in Austria, studied medicine at the University of Vienna, and committed his crimes in Mauthausen, I believe that the active involvement of your government in the efforts to bring this Nazi war criminal to justice would be entirely justified and I therefore respectfully suggest that the Austrian authorities match the reward being offered by the German government for information leading to his capture. "Even at this late date, it is still possible to bring Nazi war criminals to justice and we therefore urge your active involvement in the efforts to do so." The Simon Wiesenthal Center today called upon Austrian Minister of Health Maria Rauch-Kallat to cancel the medical degree of escaped Nazi war criminal Dr. Aribert Heim who is wanted for the murder of hundreds of inmates of the Mauthausen concentration camp whom he killed by lethal injection. Heim is the number 2 criminal on the Wiesenthal Center's “Most Wanted” list of Nazi war criminals and is the primary target of the Center's “Operation: Last Chance” project which was launched in Germany on January 26,2005 at a press conference held in the Bundestag. Aribert Heim served as a doctor at Buchenwald , Sachsenhausen, and Mauthausen concentration camps and is wanted for his role in the murder of numerous camp inmates. After World War II, he worked as a doctor in Baden-Baden, Germany and escaped in 1962, after an indictment was filed against him and he was about to be arrested. At the current time, both Germany and Austria have warrants outstanding for his arrest and there is a prize of 140,000 euros for information which will lead to his capture. The Simon Wiesenthal Center today officially launched its “Operation Last Chance” project in Germany at a press conference held at the Bundestag(German parliament) in Berlin. The press conference was hosted by German MP Prof. Dr. Gert Weisskirchen, spokesperson for foreign affairs for the ruling Social Democratic Party, and featured speeches by the Center’s chief Nazi-hunter Israel director Dr. Efraim Zuroff and Targum Shlishi Foundation founder and president Aryeh Rubin, as well as by Prof. Weisskirchen and German activist against anti-Semitism Jörg Rensmann. In his remarks, Dr. Zuroff highlighted the importance of bringing those guilty of the crimes of the Holocaust to justice and stressed that it was still possible to do so today despite the passage of many years since the crimes were committed. ”The fact that a Nazi war criminal eluded justice for 40 or 50 years does not turn that person into a Righteous Gentile”, said Zuroff. Prof. Weisskirchen and Jörg Rensmann also called upon Germans to own up to their responsibility and to help achieve justice and thereby honor memory and assist in the fight against contemporary anti-Semitism. The project is assisted in Germany by “Honestly-Concerned”, an NGO active in the struggle against anti-Semitism in the German-speaking world. The hotline number in Germany is (030)695 695 54. “Operation: Last Chance” will be officially launched in Germany on Wednesday, January 26, 2005 at a press conference to be held at 14:00 in the Bundestag (German parliament). Germany is the ninth country in which the project is being launched. It has already been initiated in Lithuania, Estonia, Latvia, Poland, Romania Austria, Croatia and Hungary. Wie Dr. Efraim Zuroff, Leiter des Simon Wiesenthal Centers in Jerusalem, heute mitgeteilt hat, muss der Beginn der „Operation Last Chance“ in Deutschland verschoben werden. Bei der Kampagne, die bereits in zahlreichen europäischen Ländern, unter anderem im Baltikum, Österreich und Polen läuft, wird eine Belohnung von 10.000 Euro für Hinweise ausgesetzt, die zu einer Anklageerhebung oder Verurteilung von bisher unbehelligten NS-Tätern führen. Ursprünglich sollte die Operation Last Chance mit einer Pressekonferenz, Anzeigenkampagne und Telefonhotline im September anlaufen. Wegen Terminschwierigkeiten wird der offizielle Start der Aktion in Deutschland auf November verschoben. Ungeachtet dessen gehen nach den vorangegangenen Medienberichten bereits laufend Hinweise beim Wiesenthal Center ein. Das Center hat heute seinen neuesten Bericht zur Verfolgung von Nazi-Kriegsverbrechern vorgelegt.